Hello everyone…yes, it has been a while. We have finally returned from 2 weeks of bliss in South Florida, what an incredible time we had. Just to feel the sunshine made it all worth it. It was a full-fledged family vacation (we really needed it). I’m still processing all the amazing things I got to experience and can’t wait to share them with you. In the meantime….these quesadillas….mercy. So, I’m not really a sweet girl when it comes to breakfast, I prefer savory. Now I do crave pancakes and all that other stuff, but put to the wire, I would choose savory over sweet nine times out of ten. Anyway, this quesadilla is going to blow your socks off. 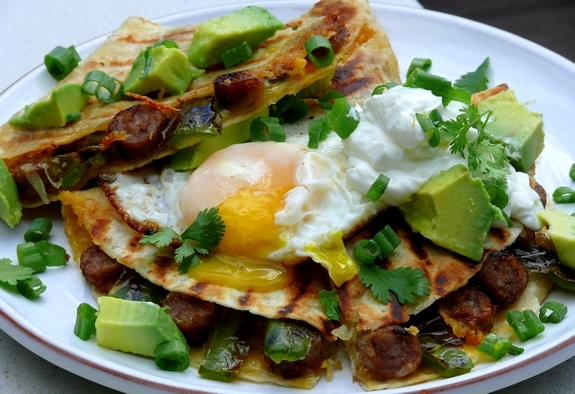 Whoever knew breakfast sausage and jalapenos were best friends in a quesadilla? Now we do. Go on with the rest of your lives, you can thank me later. Optional garnish: avocado, lime juice, sour cream, green onion and cilantro...I say optional, but really, don't leave any out. Start out by prepping your ingredients...shred your cheeses (do not use already shredded packaged cheese, it has an anti-caking agent that makes it less melty), slice onions and pick off cilantro leaves. Slice avocados last and drizzle lime juice all over them to keep them from turning brown. Using a grill pan covered with cooking spray (or any pan or method you choose), blister the outsides of your jalapeno peppers over medium heat until the peppers are soft and squishy to the touch, about 10 minutes. Rotate peppers often for best results. While peppers are cooking, begin browning sausages until all sides are brown and crispy, about 8 minutes; reserve oil made by the sausages. When peppers are done, let cool until you can handle them. Slice lengthwise in half and remove the seeds and pulp. 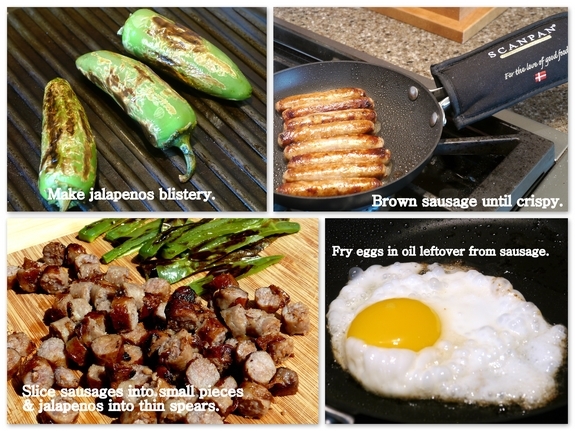 Slice jalapenos in long, thin strips while slicing sausages into small medallions. Spray outside of the flour tortilla with cooking spray and assemble quesadillas by placing both cheeses, jalapenos and sausages onto half of the tortilla and closing the other half on top, in a half moon shape. Place tortillas on grill pan, or whatever pan you choose, cooking over medium heat until cheese is melted and outside of tortilla is brown. Meanwhile, cook eggs sunny side-up in the same pan you browned the sausages in, using the leftover oil from the sausages to fry the eggs. It's up to you how well done you choose to make your yolk. Salt and pepper the eggs. Serve one tortilla sliced in half with egg on top and garnish with sour cream, green onions, cilantro and avocado doused in lime juice. You are going to love…. That look mouthwatering! 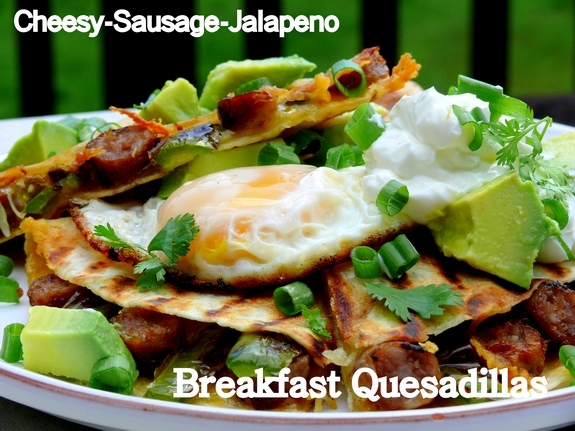 I love everything about it from the thin sausage links to the runny yolk and avocado. Yum! I really like the sound of breakfast quesadillas! FABULOUS. Love Mex for Breakfast! I was envious of all the Florida updates… it all sounded like bliss! glad you are back in time for our gorgeous glimpse of summer here, though! Wow, those look delicious! I was shopping for a new skillet several months ago, and a saleslady at Sur la Table convinced me that I must get a Scanpan. I have to say, we love that skillet! We use it at least two times a day, seriously. I recently went back to get another one in a larger size. The saleslady just smiled and said that she knew that I’d be back for more. I love hot peppers with my eggs, so this looks great to me. Hi Cathy! These quesadillas look so good — can’t wait to try them!! Just wanted to let you know that the recipe name on the printable copy of the recipe is incorrect, I believe. Though it does make me want to find the cheesy chicken and black bean burrito recipe! Wow, thanks for letting me know…how did that happen?!! : ) Cathy, I guess it happened because you are a human! I am making this recipe in the AM for our breakfast. Thanks so much for sharing this great recipe!